Is this coin Red,Red Brown or Brown and why? I have often been faced with this problem as I am sure have most of you? It often does not matter a lot but in some cases, the mintage of Red coins is far smaller and the price so much higher , that a decision on the colour of a coin can be very important. One highly acclaimed dealer sold some very red 1898 pennies to a friend of mine "voetstoets"when the pop report showed there to be only 19 graded at NGC. Well, the result was MS Red Brown and there was a lot of bad feeling at the premium price. Heritage saw an NGC MS64RD Penny sell for $9200 (R64,400) at latest auction - NGC pop report 6 graded pop2. This is not an idle decision therefore and an 1892 fully Red Penny is a very very sought after and rare item. Nobody can yet tell me exactly why a Copper coin can be Red, Red Brown or Brown. 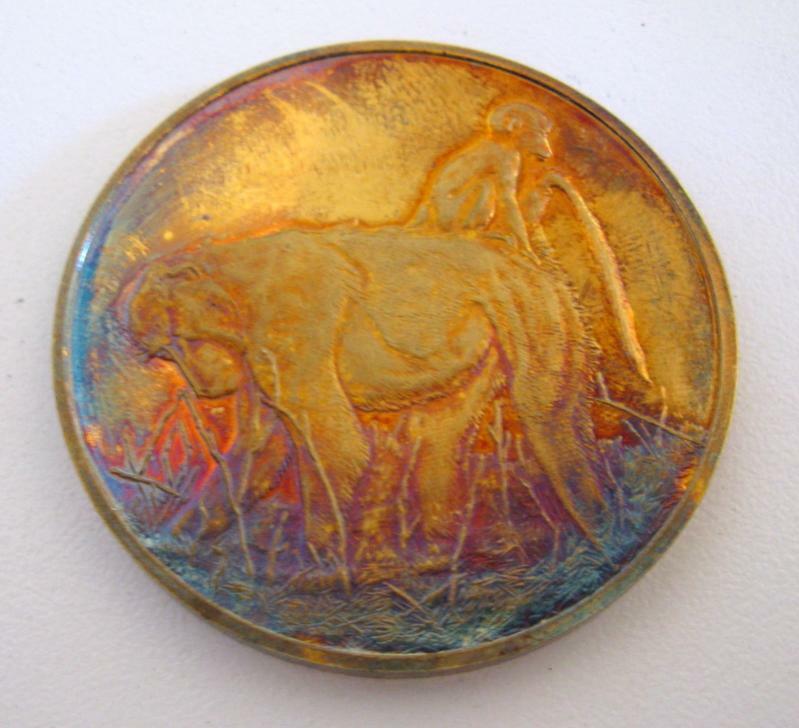 I suppose Copper is not a uniform substance and has impurities that give it variation in shades. I does seem that once it circulates, it tends to go brown. That is why especially in 1898, all the Red and Red Brown Pennies are uncirculated whereas all the circulated Pennies are Brown BUT there are some very stunning Mint State Brown Pennies up to MS65 . In some Union years like 1954 however, Red is commoner than brown and I have not had an explanation for this. A friend of mine assured me that unless you slab a red Penny and protect it from light, it will lose its redness. I will load pics but on the understanding that no photoshop tinting to be used by me or any contributor. The coin pic shown is taken under normal incandescent light bulb. I am not a numistatist and never would pretend to be knowledgeable about coins, but I must mention that tickey and sixpence pieces which came out of Christmas puddings and which I still have also look very "brown" or "brownish red". Perhaps this coin of yours was in a Christmas pudding at some time? As far as I know coins that have not been in circulation can take on this red tone as they tarnish naturally. About a year ago - on this forum, I posted a message regarding this very same issue, but for some strange reason, nobody commented on it. I do not collect ZAR, so cannot comment on the Kruger Pennies having different colours. BUT regarding the Union issues - I totally ignore "discriminating" between colours, and just stick to the dates. I would not, for example, pay more (or less) for say a Red Penny vs. a Black Penny. For me that touches on becoming a variety collector who I am not. I do, however, differentiate between a "Z" and "S" Union coin, because for me, they are not varieties, but different coins. Maybe it is because I grew up with the old SA coin catalogues - like Bickels, Kaplan, Jaffee, et al. And talking of old catalogues, in front of me is a NUMISTAT of Bickels for the years 1973/4. 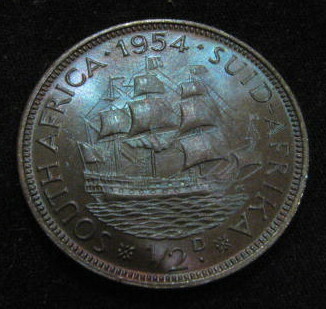 I just checked the price for a 1931 tickey in the lowest grade then -- yep - one could be had for a measly R100. I think one was sold last year by a well known dealer from Johannesburg in VG for about R70 000 or R80 000. NOTHING investment wise can beat that (vs. other financial opportunities that I am remotely interested in). But to be very honest, that is not way I collect coins - I just love them for some unexplained reason. The advise from your friend is correct. Although these coins (NGC and PCGS graded) are "relatively well sealed" there may be the smallest hole or perforation for oxygen to still enter the capsule. The initial colours at the time of grading is a result of the environment in which such copper coins were kept and I would suspect that the "red" coins may over some many years turn into RED Brown and even Brown after many more years if not kept properly. The discolouring or tarnishing of the coins takes place very slowly and over many many years especially in dry air i.e. low humidity. In areas where there is higher levels of humidity the discolouration is much faster. Tarnish" because of the oxide level in copper known as cuprous oxide or cuprite is a thin coating on the surface of a metal. We see this as a pinkish colour on brand new minted coins and change in colour from the reaction with the atmosphere "oxidation" or "tarnishing" similar to silver coins is usually very uniform and usually does not destroy the metal or surfaces unlike corrosion. You will sometimes see "black" copper coins in graded Mint state (Not Union but much older dates from Europe etc.) this is a further colour copper coins take on after the brown colour we are used to due to the reaction where the cuprous oxide has changed to a further state of oxidation to the black cupric oxide known as tenorit. Sometimes this will take hundreds of years. Jan is correct. 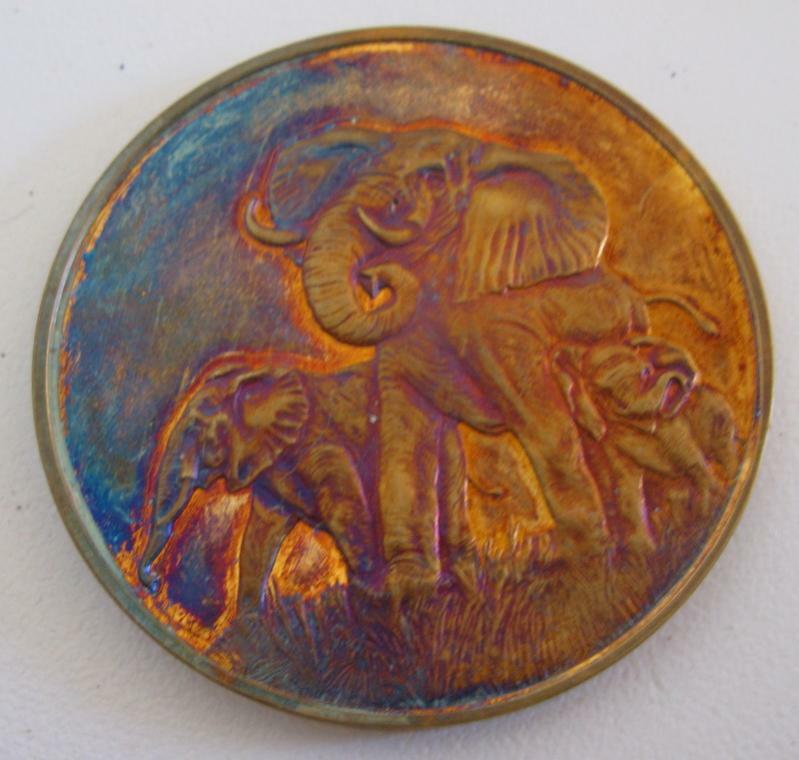 It is the envioroment in which the coins are stored which causes the coins to change color. This is not just true for copper and bronze coins but Silver ones as well. (Gold coins are far more resistant.) I have a book called "Coin Chemistry" which describes the different factors which create toning on silver coins. I have never seen an equivalent one for copper or bronze. I live in the state of AZ in the US where it is dry. I store most of my coins in the state of GA where it is humid. I have been careful to store all of my coins in a low humidity environment (a bank safe deposit box) partly for that reason. Though its true that coins can tone inside the holder ON OCCASSION, I have not had any problems with that. None of the coins I have owned, even for a long time, have changed color at all. In terms of NCG and PCGS assigning a particulaor color, I find them somewhat inconsistent. I have had coins that I thought would come back with one label come back with another and vice versa. Also particularly with red, there are different shades of red on RD designated coins and sometimes I mistake one for the other. In terms of prices, given how common an 1898 ZAR penny is, I would not pay a substantial premium for one and in my opinion, these coins are vastly overpriced for their scarcity in any grade above MS-63. Even before the RD pop soared to 165, I would not have paid a big premium for one when the pop was 19. On the others, most of them absolutely deserve a big premium because they LOOK MUCH BETTER than a RB and especially BN even in equivalent grade and there are not that many of them. (A date like the 1929 1/2D is an exception. It is not particularly scarce in RD.) Now"big premium" is a matter of opinion of course but I would VASTLY prefer to have an MS RD than a RB or BN even a couple of points higher on the MS scale given that they are much harder to find. It all depends upon how much. Last year sometime, a collector I know mentioned that the owner of one of the 1923 MS RB coins was purportedly offering or least claiming that their coin was worth R60,000. That is an absurd price because the coin as a date/denomination is not scarce and color rarity or not, it is still a 1923 penny and that cannot be ignored. The same idea applies to a certain extent with the 1892 but at least in that instance, the price structure is not out of line for the USD $9200 because the coins down the grade chain are in high demand. What I just wrote above for color, the same logic also applies to grade for "conditional" rarities. The "turning" of coins in colour has intrigued many of us collectors.I am not sure the exact mechanism is known. How much a part the sun or the air and its contents play. The process being slow would need a very patient strictly controlled climate manipulation and serial photographs to isolate which factor or factors play the main role. It is true that the Red and the Red Brown coins regardless of date are all Mint State and the act of circulation will turn their colour towards brown fairly quickly. What one has yet to explain is the number of very beautiful brown coins that are every bit as perfect as their Red or Red-Brown cousins but have not see any circulation at all. Were they minted brown or did the air , sunlight or combinations thereof change them in colour?? I might have found a clue in a coin I received from the USA to-day. It is a 1954 Halfpenny (Mintage 97 747 business strikes) that is Brown and toned beautifully blue on the reverse but looks Red-Brown on the obverse. Please see the pics. I can only assume that it lay obverse down for very many years and it was possibly the LIGHT mainly that did the colour change although it is also true that less air would make contact with the Obverse in that time too. Thats why we need a very patient scientist to strictly keep coins under controlled conditions. I might add that blue toning of lustre is fairly common in high grade mint state and proof brown coins and adds hugely to eye appeal. I also show pics of three different 1930 Pennies from my collection that are undoubtedly in keeping with the colour graded and have not changed whilst in the slab in all the years I have had them. The Red Penny was bought in 2007 already in an old NGC slab then and has stayed unequivocally red. The number graded has stayed at five since then compared to nine for the red brown and forty-three for the brown. I am sure the brown graded numbers have gone up a lot since 2007 and include 17 circulated coins down to VF. All the Red and Red Brown coins remain Mint State as usual. The market cannot be blamed for paying a premium price for such attractive red and red-brown coins that have continued scarcity and perfection. P.S. No photoshop used on any of the pics and all taken under identical light and exposures by the same camera. The toning examples you cite are well known among US collectors and if you are interested in this topic, you can do a search on the NGC Message Boards. I have never seen a RD circulated bronze or copper but in my opinion, I have owned and seen some AU RB. NGC just does not designate circulated coins as RB. On the specific coins you mention, coins stored in US coin albums, in envelopes, in humid enviroments or environments which are not chemically neutral or even in plastic 2X2 "flips" will change color, some attractive and some not. Members of the NGC Message Boards have mentioned album toning (one or both sides) several times and yes, it does take a long time. There are also coin "doctors" who artificially tone coins because some US coins sell for substantial (and exorbitant and absurd) premiums over their non-toned counterparts. In my opinion, toning is toning and from what I know, the only way to tell is by comparing the "look" of coins that are known to tone in that manner over a long period of time to those that look different. 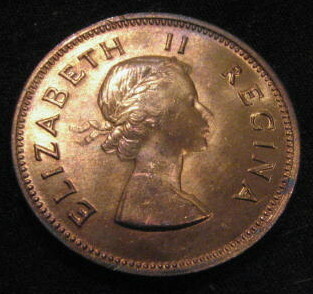 If the coin does not look like most other toned coins, its possibly or likely "artificial". On the prices, I agree that eye appeal matters. It matters a lot. And eye appeal can mean the grade, the color, the toning pattern or a combination. However, what I find irrational in the market pricing is the premiums which are paid for this eye appeal. 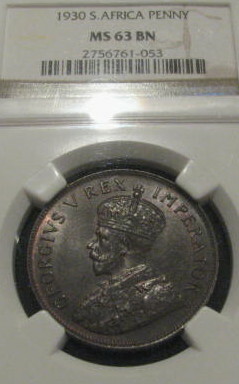 Today, the market places a greater premium on it than on scarcity which I do not agree with and in my opinion, from a financial standpoint, there are better FUTURE opportunities to obtain a return on "investment" in slightly lower grade but scarcer or much scarcer coins than in "conditional" rarities, "rainbow" toned specimens and sometimes RD versus RB and BN. The opportunity will depend upon the exact coin and what it sells for versus what it looks like. Whatever the market is, the way to lose money is to do whatever everyone else is doing and I see no difference in coins. Now in a rising market, those who follow the crowd may still make money but they will make less than those who avoid chasing relatively overpriced coins which is exactly what most collectors do who spend "real" money. 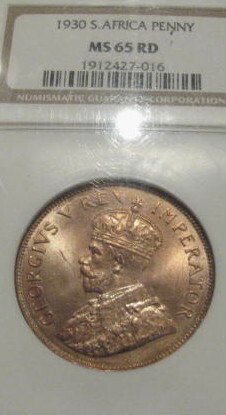 The 1954 Halfpenny shown in this posting received MS65 Red Brown (pop1 shared ) at NGC recently. Coins take on all sorts of tones and I added 2 photo's to that thread of the "Wild life series" that have taken on the same colours. 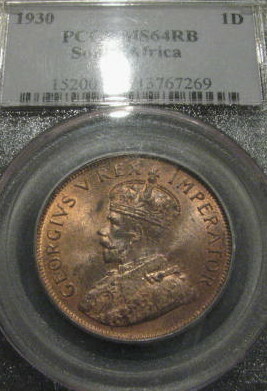 Looks similar to my 1932 Halfcrown in toning colours.